McIntosh Gallery is the oldest university art gallery in Ontario. It opened with an exhibition of paintings by war artists from the National Gallery of Canada. The first exhibition of contemporary Canadian art, including works by Paul-Émile Borduas, Jean-Paul Riopelle, Jack Shadbolt and Kazuo Nakamura, opened in 1959. The following year, Michael Snow and Gordon Rayner were included in a major international exhibition featuring works by Edgar Degas and Marc Chagall. Contemporary artists from Southwestern Ontario have been the primary focus of exhibitions, programs and publications. From 1960 to 1978 an innovative artist-in-residence program engaged artists Greg Curnoe and Colette Whiten, among others, in curatorial, educational and collecting activities on campus and within the community. Sponsored by the Canada Council for the Arts, the residency program continued until 1980. During the 1990s, McIntosh inititated several projects that garnered critical recognition through international exchanges. Following the first Gulf War in 1991 McIntosh organized Travelling Theory, a seminal, international exhibition coordinated by London artist Jamelie Hassan in collaboration with the Near East Cultural and Educational Foundation of Canada. Curated by Suhail Bisharat, Director of the National Gallery of Art in Amman, Jordan, and featuring contemporary art from the Middle East and Canada, this community-based, collaborative project was the first of many organized by McIntosh that brought international and regional interests together through the visual arts. From 1993 to 1995, in collaboration with the University of Heidelberg, the Heidelberg Kunstverein and the Karlsruhe Centre for Art and Technology, McIntosh facilitated the creation of a site-specific, outdoor sculpture in Heidelberg by Toronto artist Stacey Spiegel. In 1995 McIntosh organized Ron Benner: All That Has Value, which traveled to the Edmonton Art Gallery, Presentation House Gallery, North Vancouver, and the Dunlop Art Gallery, Regina. Exhibition curator Peter White and internationally acclaimed environmental activist Pat Roy Mooney wrote essays for the catalogue. In 1996, Jeff Wall's Steve’s Farm, Steveston, 1980, part of McIntosh Gallery's collection of over 3,500 works, travelled to the Hirshhorn Museum, the Smithsonian Institution, the Museum of Contemporary Art, Los Angeles, and the Art Tower Mito, Japan, as part of a major solo retrospective. Also in 1996, McIntosh organized Metaphorical Transformations, a solo exhibition of photographs by internationally acclaimed London, Ontario artist Stephen Livick. It traveled to Yokohama, Japan. In 1998, McIntosh and Museum London organized a Murray Favro exhibition curated by Peter White. The catalogue featured essays by Mr. White, Matthew Teitelbaum, Helga Pakasaar and Robert Fones. 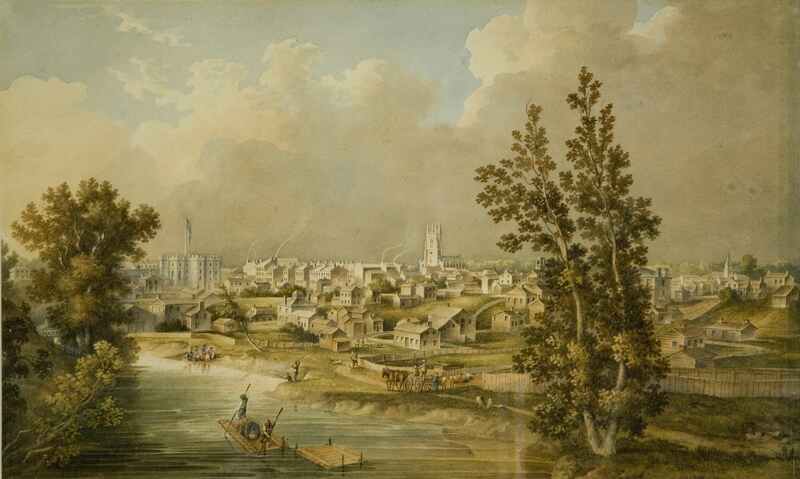 From 2002 to 2004 McIntosh circulated Tom Benner: Cruising the Margins to the Art Gallery of Windsor, the Frick Art & Historical Center, Pittsburgh, the Appleton Museum of Art, Ocala, Florida, the Station Gallery, Whitby, Rodman Hall Arts Centre, St. Catharines, the Tom Thomson Memorial Art Gallery, Owen Sound, the Art Gallery of Algoma, Sault Ste. Marie, and the Thunder Bay Art Gallery. In fall 2009, the Canadian premiere of Michael Snow's Condensation. A Cove Story was organized and presented by McIntosh Gallery as part of LOLA (London Ontario Live Arts Festival). Filmed over days at a cove along the rugged Atlantic coast of Canada, Snow compressed a surprising range of weather events into this silent projection's ten minute duration. The word “condensation” in the title thus refers to both the weather itself and the compression of time within the work. In 2010 McIntosh purchased Condensation. A Cover Story for the collection. 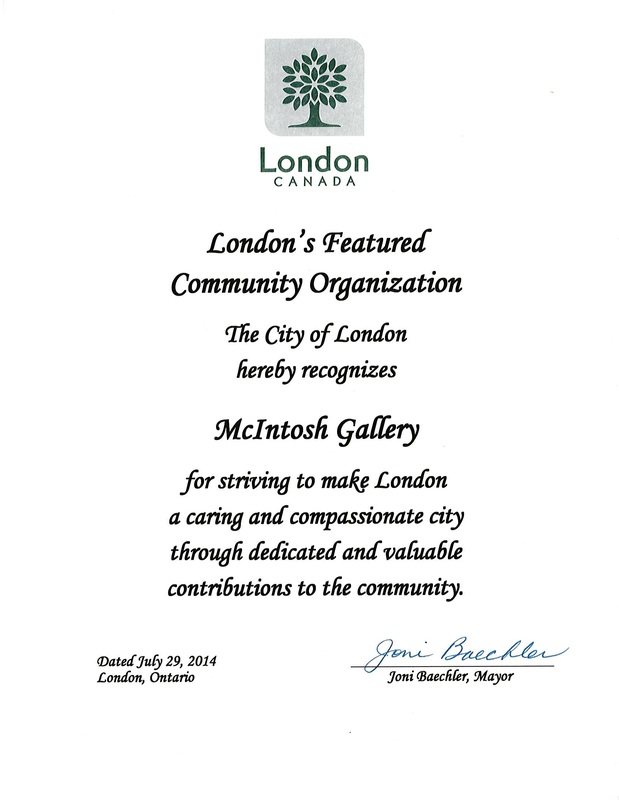 In the summer of 2014, McIntosh Gallery received recognition as "London's Featured Community Organization", an honour presented to Director/Chief Curator James Patten by Mayor Joni Baechler in celebration of the gallery's outstanding contributions to the city.